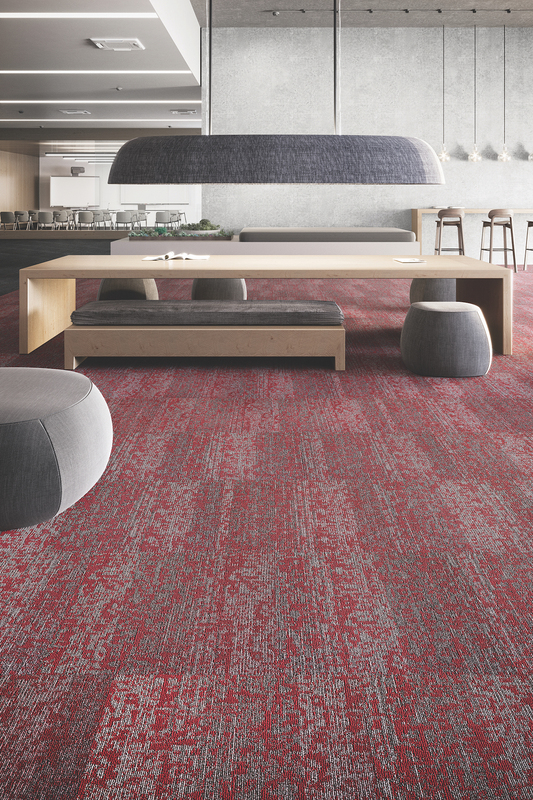 Mohawk Group's Rise Up carpet tile from the Learn & Live Collection is manufactured using next-generation Duracolor Tricor carpet fiber. CALHOUN, Ga., March 20, 2019 /3BL Media/ — With enhanced soil-hiding and removal capabilities, Mohawk Group’s innovative Duracolor Tricor builds upon a sustainable nylon fiber already trusted to perform in demanding environments. With its groundbreaking, modified-delta shape and triangular hollow core, next-generation Duracolor Tricor delivers enhancements that provide unsurpassed stain resistance, colorfastness, durability, color clarity and superior soil performance. Mohawk Group’s commitment to sustainable product design and manufacturing extends across the Duracolor family of solution-dyed nylon fibers. Duracolor Tricor is Declare Red List-free, includes recycled content and is recyclable through Mohawk’s ReCover Program. With most stains easily addressed with water, Duracolor Tricor helps reduce the need for harsh cleaning chemicals. Additionally, its extended life cycle minimizes environmental impact. Duracolor set the standard for commercial carpet fiber when it was introduced in 1992 and has since been used in more than 175 million square yards of installations worldwide. Inspired by bridges, trusses and their triangular support systems that deliver the ultimate in load-bearing performance, Mohawk’s engineers integrated these principles to create Duracolor Tricor with tremendous strength for enhanced durability. Its shape improves resilience and reduces surface wear of carpet, while also optimizing color clarity. Mohawk’s patented Duracolor process for permanent built-in stain resistance repels the most common causes of staining, up to 96 percent of which can be cleaned with just water. Duracolor Tricor’s longer product life cycle ultimately helps specifiers and end users save time and money. Also, the fiber’s ability to retain its beauty between cleanings makes commercial spaces easier to maintain. Duracolor Tricor was put to the ultimate test when Mohawk Group's Learn & Live carpet tile was drafted to greet guests in a fan zone experience leading up to the big game last month in Atlanta. More than half a million football fans at Centennial Olympic Park made their way through security check-in stations outfitted with Learn & Live. Thanks to Duracolor Tricor and its innovative construction, the flooring exceeded performance expectations. At the event’s conclusion, a week of wear out in the elements including countless spills was easily steam-cleaned without using any chemicals. The Duracolor Tricor fiber retained its brilliant color and shape without being crushed under the pressure of a high-profile event. Duracolor Tricor will be incorporated into all future Mohawk Group carpet tile and broadloom collections, in addition to existing styles within Textural Effects, Healthy Environments, Moving Floors, Color Beat, On the Scene and others. To learn more about Duracolor Tricor fiber, please visit MohawkGroup.com/Duracolor-Tricor. As the world’s leading producer and distributor of quality commercial flooring, Mohawk Group believes that better floor coverings emerge from better design, innovation, sustainability, project solutions and operational excellence. Mohawk Group addresses the unique challenges and opportunities in contract interiors with a comprehensive carpet and hard surface portfolio of all types and price points. As the commercial division of Mohawk Industries, the company has a heritage of craftsmanship that spans more than 130 years. To learn more about our full line of flooring products, please visit MohawkGroup.com.